MADRID – From radio to television to virtual reality, ‘The Olympic Games: Behind the Screen’ exhibition provides a living history of how modern media conveys the Olympic values around the world. 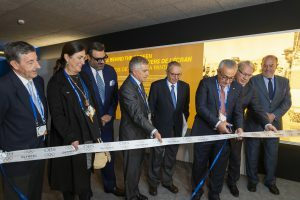 The exhibition was inaugurated at a special event held Tuesday, 13 November at its new, permanent home at the headquarters of Olympic Broadcasting Services (OBS) and the Olympic Channel in Madrid, Spain. Olympic Broadcasting Services (OBS) was created by the International Olympic Committee (IOC) in 2001 in order to serve as the Host Broadcasting organisation for all Olympic Games. As Host Broadcaster, OBS is responsible for delivering the pictures and sounds of the Olympic Games to billions of viewers around the world. It produces and transmits unbiased live radio and television coverage of every sport from every venue. OBS has developed a consistent approach across all Olympic operations while at the same time optimising resources to continually improve the efficiency of the Host Broadcast operation. OBS does so to ensure that the Games’ Rights Holding Broadcasters (RHBs) are satisfied with the overall television production of the Olympic Games and that the impact of the broadcast footprint on the host city is as minimal as possible.